The lenses for larger sized, megapixel sensors up to a diagonal of 16mm are also broadband coated and may be used alternatively in the visible (VIS) or near infrared (NIR) ranges, but not both at the same time. The robust mechanical design with lockable focus and iris setting mechanisms guarantees long-term stability even in typical production environments. 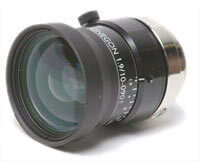 The Cinegon 1.8/16mm lens accepts an M30.5×0.5 filter thread, while the Cinegon 1.9/10mm lens uses a filter adapter to accept an M62x0.75 filter. Compact Series lenses are also available for 11mm and 22mm sensors.